Seats are pricey at Manchester United. Even a footballer on astronomical wages is upset at the cost of watching the Red Devils. 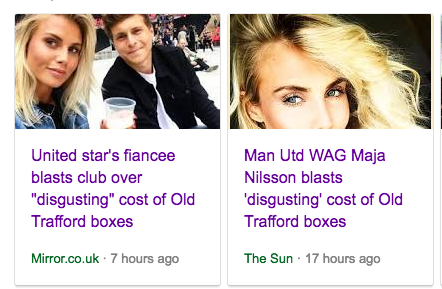 The Daily Mirror says Victor Lindelof’s fiancee “blasts” Man United over “‘disgusting £82,000 cost for Old Trafford executive boxes'”. The story has been removed from both the Sun and Mirror’s websites.